Excellent service from start to finish. Facility is top notch. Dr Clarin was amazing always making you feel comfortable and explaining every step of the process he is doing Appointment on time and. I waiting time. Highly recommend this to anyone in need of eye care. Amazing service I went to visit for the first time because I saw they had good ratings. I met with Dr.Susan Sherr and she was very sweet & funny she performed every thing smoothly & explained every thing she did & why. She also explained why I was having headaches & gave me great advice as a student who’s on the computer & studying a lot. This place also had a lot more brand glasses like Ray Bans that Americas Best & Vision works don’t have. & I also found a pair of glasses that I loved! All the people were helpful, nice, & explain every thing in depth. I will be coming here again in the future! I highly recommend trying this place out if you’re tired of Americas Best or Vision works. Dr Clarin is the best. Always treats me well, his staff is super friendly, and his tech is state of the art. My experience here was great. Dr. Sherri took great care of me and I will definitely be going back in the future. Great facility with great staff and doctors and top of the line equipment. They also had a great selection of frames I was very happy with the over all experience. Thank you Clarin Eye Care! Dr. Clarin is a fine doctor and takes the time to thoroughly examine his patients and prescribe the right treatments and prescription. He is personable and caring. Dr. Sheer is the best and the other staff members, are amazing. One of the ladies offered to watch my Lil girl while Dr. Sheer did a last exam. I wasn’t to keen on letting my 6 month old around strangers, but the lady (forgot her name) stayed close to the room I was in, keeping my daughter from crying while Dr. Sheer left the door open so my baby and I could be at ease. They deserve more than a 5 star rating. Oh and the prices are affordable. Great job Clarin Eye Center. I have to say that Clarin Eye Care is state of the art but more importantly, I felt like I got the highest level of care that is possible from a specialist. For my exam, my eyes were looked at through 4+ incredible machines, I then spent time with Dr. Adam Clarin going through the results and doing a few more exams. The level of care from the front desk, through the eye techs to the doctors is unbelievable. I said this before… if you would drive 45 minutes to your favorite anniversary dinner spot, of course for your yearly eye exam, you should go see the best eye team around. I would say if you are living anywhere from Homestead up through Aventura, this office is your #1 choice. Fabulous people. Professional, caring and of course above all COMPETENT. Every employee knows their role perfectly and works seamlessly with the rest of the team to make sure your visit is efficient and that your care is first-class. My wife and I have been patients for years and it just keeps getting better. Congratulations and keep up the great work. In addition to providing great clinical care (exam) — I have seen both Dr. Clarins (son and father!) — their entire staff is extremely professional, while still being “real” — they are patient, super helpful with making appointments, verifying insurance, and helping with picking out glasses (which they have onsite!!)…. I complimented them today for being SO easy to schedule an appointment with by phone (and so professional) — which is very refreshing (and not always the cast elsewhere). I highly recommend them (and I am someone who used to only see opthamologists — I feel that they are very knowledgable — about the latest clinical topics, but also about health policy and business….). Excellent service. Fast and to the point. High end technology for examining the retina. Another successful visit to The Clarin Eye Care office! Another successful visit to The Clarin Eye Care office! Our daughters first vision exam with Dr. Adam Clarin was perfect but I truly expected nothing else!! From making the appointment, to the follow up texts so you don’t forget (love that) to the actual visit everything is just so easy and professional. The team well what can one say…THEY ARE AWESOME, friendly and patient and PASSIONATE!! Love you all!! Excellent service, chic atmosphere, up to date with technology. Actual concern and imparting education on eye care without being overbearing. Awesome selection of frames. Great with kids! I’ve been with Clarin eye care for 4-5 years, one gets accustom to quality. Excellent! Dr. Adam Clarin is very knowledgeable and uses the latest technology to provide the most accurate results. I have been using Clarin eye care for over 20 years from father to son, the quality of service and care has never faltered. The friendly staff and beautiful showroom are very welcoming and the Doctors are some of the most knowledgeable in there field. I love being able to see well and with Clarin eye care I see great! EXCELLENT SERVICE, THANK YOU!!! SINCE THE MOMENT THE YOUNG LADY ANSWERED THE PHONE TO THE MOMENT MY SON SAW THE DOCTOR!!! WILL RECOMMEND YOUR OFFICE ALWAYS!!! 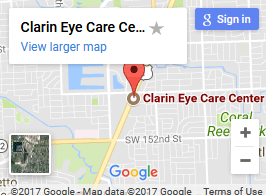 I have been going to Clarin Eye Care for many, many years. I have never been greeted with anything but terrific smiles each time I walk through the door. The staff are all wonderful, professional people and the doctors really know their stuff! I have many friends and colleagues who I’ve recommended and I would recommend them to everyone. Love this place! Moved to Ft.Lauderdale but I am always willing to drive there for my appointment because they are so friendly and kind and take care of their patients. A few days after meeting Dr. Adam Clarin at a business networking event I started experiencing some redness and burning in both of my eyes. In my profession I see patients all throughout the day and was worried about my appearance and the possibility of having an infection in my eyes. I called Dr. Adam Clarin on Monday morning to see if he could see me as an emergency, given that I needed to go to work later that day. He moved his schedule around and quickly fit me in. The office staff was wonderful, the atmosphere was clean and professional and Dr. Adam Clarin did a great examination and explanation of what was going on with my eyes. Thanks to him and his staff I was able to get to work and see clients immediately!